This post was originally published on March 22, 2010. It was substantially revised and re-posed on March 2, 2015. 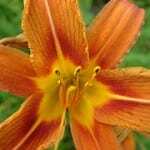 Here’s another distinctive floral name, recently boosted by a television show baby. Thanks to Lyndsay for suggesting Marigold as Name of the Day. At first glance, Marigold might seem like yet another outlandish botanical name. We’re all about blooms these days, from pan-botanicals like Florence and Blossom, to flower names like Lily and Azalea, to flowering trees, like Magnolia and Rowan. 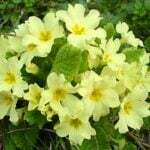 If it grows in the garden, it could be considered for a child’s name. And yet Marigold is, in a subtle way, a spiritual name, too. It’s a contraction of the phrase “Mary’s gold.” While the Virgin Mary was poor as a church mouse in life, the golden flowers have long been associated with the saint. There’s even a great legend about Mary being accosted by a gang of thieves. When they opened her purse, marigolds fell out instead of coins. 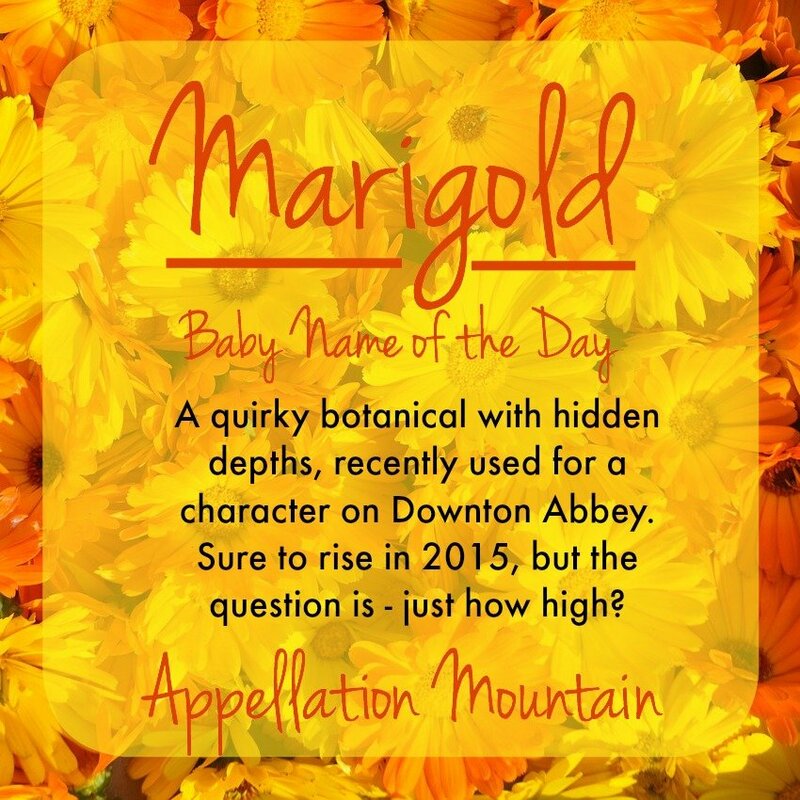 That’s probably apocryphal, especially since the name marigold didn’t definitely attach to the flower until the 1300s. All of this makes Marigold an offbeat elaboration of Mary, and a name with meaning beyond the garden. I’ve seen Marigold listed as a flower name used by Victorians. The US Census records give us a smattering of girls by the name in the mid to late 1800s, so that feels right. Winston Churchill and wife Clementine gave the name Marigold Frances to their fourth child, born just days after the end of World War I. Unfortunately, Marigold died of an illness when she was just three. Lucy Maud Montgomery penned Magic for Marigold in 1929. Her Marigold was a well-to-do farmgirl named after an aunt. The story details Marigold’s experiences growing up. Jean Ferris has written a young adult series about a Princess by the name. The first book is called Once Upon a Marigold, and the fourth installment in the series is expected soon. Rufus Wainwright’s “Rebel Prince” is about a girl named Marigold. played the main character, an American B-list actress stranded in Mumbai after a movie falls through. Instead, Marigold lands a role in a local flick and falls for the choreographer, played by Bollywood’s Salman Khan. Then came The Best Exotic Marigold Hotel, a 2012 movie about a group of British pensioners who chose to retire to a hotel in India for a variety of reasons. Based on a 2004 novel called These Foolish Things, the movie was enough of a success to inspire a sequel, in theaters February 2015. While the name has never cracked the US Top 1000, 26 girls were given the name in 2013 – a new high. If you’re watching Season Five of Downton Abbey, there’s another little Marigold that will come to mind: Lady Edith’s secret daughter. There’s no reason given for the choice of the name – at least, not yet. But it’s the kind of profile-raising exposure that could have more and more parents considering the name for their daughters. 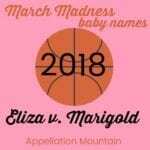 With nicknames from Mari and Mary to Margo, Goldie, and maybe even Maggie, this is the kind of bold name that stands out and fits in. If you’re after a feminine name with meaning and strength, Marigold is one to consider. What do you think of Marigold? Will the Downton Abbey association make this name more popular? Is Marigold the new Violet? My daughter Marigold was born in 2014 before the Downton character… And I’m asked often if that is where I got her name. I’ve actually never seen an episode! I fell in love with the name after reading Magic for Marigold as a kid. She’s our little Goldie girl. The only annoyance is when I introduce her, people hear “miracle” instead of Marigold. Lol. They’ll say, “miracle?” Ugh, no Marigold… I have started to introduce her as Goldie. I do not want this name to become a trend! I CRINGED when Marigold’s name was first mentioned on Downton Abbey! My daughter is one of the 26 born in 2013, and I thought it was safe from a surge in popularity! To be completely honest, I was hoping some tragedy would befall little Marigold, and she’d have a short life on the show. Ha ha! I did at first, too, but then I started to like hearing the name said aloud on the show. It’s one you never hear. I really hope it doesn’t increase in popularity, though. I don’t want MY Marigold to be part of a fad. Marigold is right at the top of my list if I ever have a daughter. 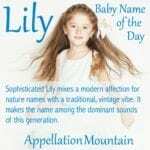 Love the sprightly sound, love the flower, love the spiritual underpinning – and Goldie is such a cute nickname for a little girl! On the one hand, I hope the Downton reference doesn’t make her too popular here in the UK, on the other, it might diminish her association with a very well-known brand of rubber gloves! The response of pretty much everyone I’ve mentioned the name to has been, ‘Like the glove?!’. I love Marigold so much. Unfortunately, with my husband’s last name, it would sound like merry-go-round, and that is not my jam. For fictional representations, there’s a great character in the webcomic Questionable Content named Marigold Farmer. She’s a little shy, a little awkward, but very lovable and a reasonable namesake. Yes!!! That was the book that gave my daughter her name! I read that book in 6th grade, fell in love with the name and that particular chapter, and twenty-five years later, still loved it enough to call my daughter Marigold. Love, love, LOVE! I’ve wondered why Julian Fellows, writer of Downton Abbey, would choose Marigold as the name for Edith’s daughter since Edith and her sister Mary don’t get on at all. 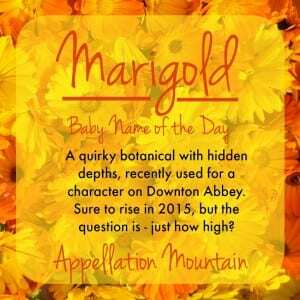 It seems that Marigold is pronounced both ways by various characters in the series — sometimes Mar-ih-gold, but often as Mary-gold. It’s not believable that Edith would choose that name for her daughter. I agree that it’s not believable and wonder if we’ll hear the story as to her name. I disagree. I think it is a believable name for Edith’s daughter. Because of Edith’s hair color, I imagine she could have been called Marigold as a small child, or perhaps it was a term of endearment that Gregson used for Edith. Replying on my old comment. Oh, and our Marigold’s nickname now is Goldibear or Mairzy (can’t tell you how many times we sing the 1940s “Mairzy Dotes” song). I’m expecting our #7, and thinking about using Marigold. We think it sounds nice paired with our next youngest, Cora Dove. my name is marigold..people say it’s one nice name..classy and defines my personality..as for my nickname.. I think this might be another incomplete entry? I keep stumbling across them. Anyway, I’ve recently fallen in love with Marigold. I think she’s sweet, eccentric, and surprisingly strong. I wish I could think of a good nn. “Goldie” makes me think retirement home. We have it on our middle name list for a daughter. My husband’s grandmother is named Floris Marie — he really wants to name a daughter after her, but I don’t love Floris or Flora, and Marie is just SO predictable in the middle name slot. Marigold seems perfect. It starts with “Mari” like Marie, and it’s floral like Floris. Sonia Marigold and Susanna Marigold are the two favorite combos of the moment. It is such a pretty name, and very sweet yet strong. I’d love to meet a little girl with this name. Thanks for this! Theoretically I love Marigold, but she is just so bold. I love the nickname Goldie so much, and that’s what makes me want to use Marigold more than Magnolia. I have a feeling people would say, “Her name is Marigold?” all the time, and that’s just annoying. But who knows, maybe I’ll get over that. It’s at least a stunner in the middle. I like Marigold, and if lived somewhere a little less conservative and mainstream, I would definately consider using it for a first name. I agree with Sebastiane, though, that it would make an awesome middle name. I am more apt to use names that might be a little too “out there” for this neck of the woods for a middle. I like Nevena. My only problem is that it is too close to Neveah, and some people might mistake it as such. Ooo, I adore Marigold, she is so sweet and feminine. 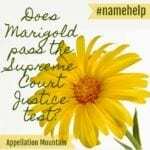 She would make an awesome middle name for something more common or plain, like Ruth Marigold, Jane Marigold or Emma Marigold. Marigold is cute, but I don’t love it for my own use. And while the flower is fiery and pretty, I dislike their smell, so that’s a bummer association. Nevena is absolutely lovely.